On this episode of Design Santa Barbara we exploring the great castles of Europe that where often homes to Queens and Kings or very wealthy people who could live in these architectural wonders. Our First visit on this journey is to Chambord Castle in france. This one of the most recognizable in the world because of its very distinctive French Renaissance architecture. Which blends traditional French medieval forms with classical Renaissance structures. The building, which was never completed, was constructed by King Francis I of France. Chambord is the largest château in the Loire Valley; built to serve as a hunting lodge for Francis I. Who maintained his royal residences at the Château de Blois and Amboise. The original design of the Chambord, also known as “Château de Chambord” is attributed. Though with some doubt, to Domenico da Cortona; Leonardo da Vinci may also have been involved. The château features 440 rooms, 282 fireplaces, and 84 staircases. Four rectangular vaulted hallways on each floor form a cross-shape. Another great castle is the Pena Palace (Portuguese: Palácio da Pena) is a Romanticist castle in São Pedro de Penaferrim, in Portugal. 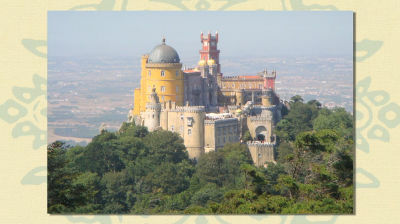 The castle stands on the top of a hill in the Sintra Mountains above the town of Sintra. Furthermore, on a clear day it can be easily seen from Lisbon and much of its metropolitan area. It is a national monument and constitutes one of the major expressions of 19th-century Romanticism in the world. The palace is a UNESCO World Heritage Site and one of the Seven Wonders of Portugal. The palace quickly drew visitors and became one of Portugal’s most visited monuments. The red and yellow façades faded over time. Edinburgh Castle is a historic fortress which dominates the skyline of the city of Edinburgh, Scotland. From its position on the Castle Rock. Archaeologists have established human occupation of the rock since at least the Iron Age. There has been a royal castle on the rock since at least the reign of David I in the 12th century, and the site continued to be a royal residence until 1633. As one of the most important strongholds in the Kingdom of Scotland. Edinburgh Castle was involved in many historical conflicts from the Wars of Scottish Independence in the 14th century to the Jacobite rising of 1745. Research undertaken in 2014 identified 26 sieges in its 1100-year-old history. Giving it a claim to having been “the most besieged place in Great Britain and one of the most attacked in the world”. The castle stands upon the plug of an extinct volcano. The Castle Rock is the remains of a volcanic pipe. Which cut through the surrounding sedimentary rock before cooling to form very hard dolerite, a type of basalt. resisted by the dolerite was Subsequent glacial erosion. Which protected the softer rock to the east, leaving a crag and tail formation. Neuschwanstein Castle is a 19th-century Romanesque Revival palace on a rugged hill above the village of Hohenschwangau near Füssen in southwest Bavaria, Germany. The palace was commissioned by Ludwig II of Bavaria as a retreat and in honour of Richard Wagner. Ludwig paid for the palace out of his personal fortune and by means of extensive borrowing, rather than Bavarian public funds. It was open to the public shortly after his death. Since then more than 61 million people have visited Neuschwanstein Castle. More than 1.3 million people visit annually, with as many as 6,000 per day in the summer. Neuschwanstein embodies both the contemporaneous architectural fashion known as castle romanticism, and Ludwig II’s immoderate enthusiasm for the operas of Richard Wagner. The inspiration for the construction of Neuschwanstein came from two journeys in 1867 — one in May to the reconstructed Wartburg near Eisenach, another in July to the Château de Pierrefonds, which Eugène Viollet-le-Duc was transforming from a ruined castle into a historistic palace.